DIY Halloween Costume Ideas for Kids including Cute Kids Costumes, No Sew Costumes and Disney Inspired Costumes. Saving Money on Costumes is a huge bonus! Are you looking for some DIY Halloween Costume Ideas for Kids? If you don’t love buying expensive costumes year after year or maybe you just love a fun project I have a great list of costumes I’ve gathered together to share with you. These DIY Halloween Costume Ideas for Kids are sure to be a hit with you and your kids! With a white shirt, black pants, felt and liquid glue this easy no-sew costume can be used for a boy or girl. Maybe even make a whole herd, wouldn’t that be cute to go trick or treating with a bunch of friends or family all dressed as cows? 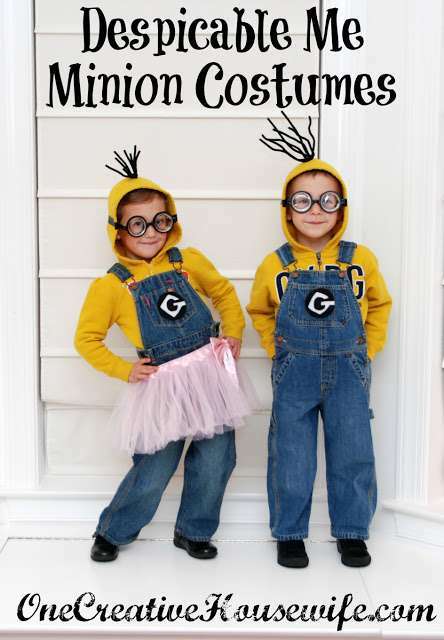 This would be such a fun costume for siblings or friends to wear together! The main pieces in this costume are a yellow hooded sweatshirt, overalls, black shoes, black gloves and glasses. It will take a a few more craft supplies to put it all together, but you don’t even have to sew! This is SO cute for a little girl! You’ll need some colorful yarn, white outfit, felt, gold tape and a few other supplies to make your darling into a fancy unicorn. This costume is no-sew and it cost Rebecca at the first hundred only $7.50 to make! You’ll need several pieces of colored felt to get started. My kids love Pizza, so I’m thinking this might be this years costume! I also love that you can layer clothing underneath if the weather is a little chilly. All you need for this costume is a white hooded sweatshirt or white shirt & beanie, 4 colors of felt, brown pipe cleaners, pillow stuffing, white duct tape and 2 wooden skewers. My son is all about legos, so this would be fun to make for him! Using Cardboard Boxes, Yellow Solo Cups, Yellow Spray paint, Yellow Duct Tape and a few other supplies you probably have on hand this is a pretty easy costume to make! By using a white shirt and black pants you already own this idea is fairly inexpensive. Make the mask with some fairly common craft supplies and the tie with felt and ribbon! With the new Cars3 movie that came out this Summer, I had my mind on a Cars character Costume. Using large boxes, duct tape, spray paint and mostly other items you probably have around your house you can make this without much investment! Going back to my childhood years of watching the Flintstones, this costume idea excited me! The main supplies for this one are Lime Green Fleece, Black Felt, White Paint and Cardboard. It does require sewing, unless you know how to rig it without! Using Green footie pjs (which are my favorite kid jammies by the way) you just need felt, a roasting pan for the shell (how genius), green spray paint and a few other items. Plus this one is no-sew so anyone can make it! I’m pretty sure my Son would love this one! Using a dress you already own, you determine how much White, Orange and Yellow Felt you’ll need to make sure each part gets wider towards the bottom. You’ll cut a hole in the white felt for your child’s head and also two on each side for the arms. This requires a small amount of sewing. Then just layer with a long sleeve white T-shirt! Purchase a Red Stocking Hat, Felt and a Chalk Marker to make the Elmo Face. You can use any Red clothing to make the Elmo body such as a Coat, Shirt, Leggings, Pants, Dress & Tights. This one is great because you can re-purpose everything but the hat so it’s a cost-effective costume! My son is so good at solving these Rubiks cubes, I have to have him be this for Halloween! Easy easy, just get a huge square cardboard box, paint it black (or just the areas that will show behind the cardstock), and then use colored cardstock for the squares. You can use a corner punch to round the edges of the paper. There are a few more steps, but nothing too hard! I like that this costume uses some things we already own like Goggles + Snorkels, Sponge Hair Curlers, Black Shirt and Pants, and of course empty 2 liter soda bottles. I could see this being a fun imaginative costume to use daily and not just for Halloween! Don’t Forget to Share this Post on Pinterest to save these ideas for Later!